What to do when you no longer love the style of your home?!! When my husband and I were first married our style was black furniture with tan and red accents. Hard to believe right?!!!! 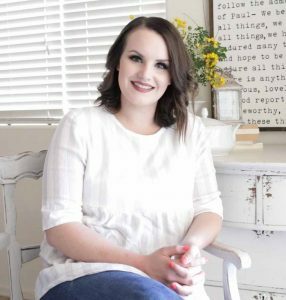 My style has evolved so much in 7 years and while it may seem daunting if you’re sitting around in a house that’s fully furnished, but not the style you love. I can honestly say I have been there. We were married young and didn’t have a lot. We saved every penny from our wedding gifts to buy a couch, and then years later we were finally able to purchase a second hand table and I painted it black. We moved into our current house along with those items we had scrimped and saved for and I felt so incredibly guilty that I didn’t love them anymore. and I was itching to really change up my style. It started slowly. First I painted all the black frames I owned white and distressed them. Then I started to collect, very slowly, a few small items I loved that reflected my new style to hang on my walls and sit on my shelves. Some of that was done by also making over items I already had with a can of white spray paint!! Then I started to paint furniture we had and that I had found for dirt cheap or even free on craigslist and goodwill, I then sold a few things I knew I couldn’t make “my style” with the money I made from selling the pieces I didn’t love and I purchased new things. Look at these little fuzzie haired boys!! 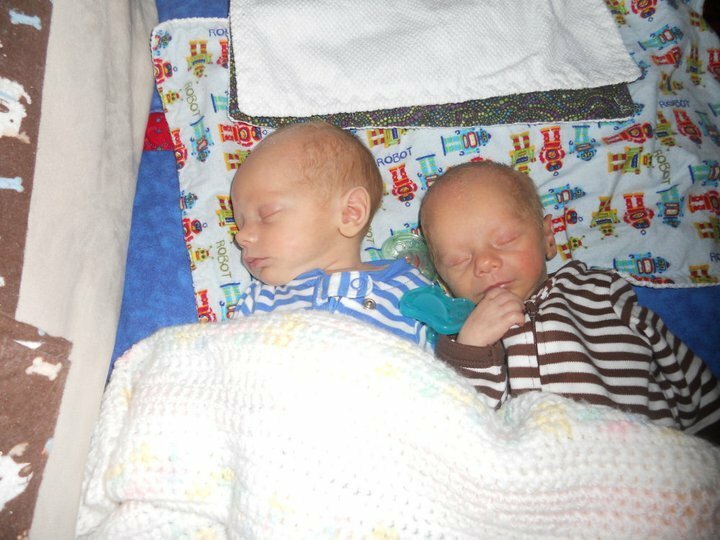 Gahh how were they ever this little! and immobile?!!! It’s so easy to look at a beautiful magazine worthy picture online and think. Gosh if I had all the money in the world “THEN” I could have ?a house like that. 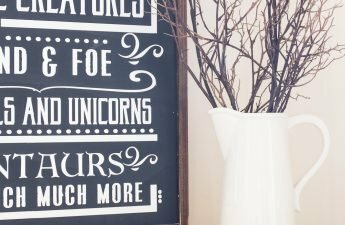 But I’m living proof that it doesn’t work like that for us “real people” and while it may seem overwhelming and out of budget right now with some elbow grease and paint you can transform your home to create the style you love. For me its farmhouse & white. 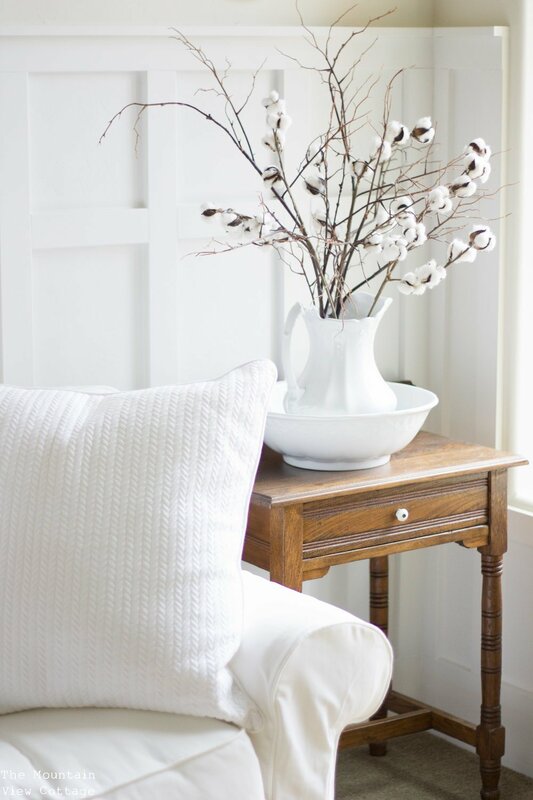 I love all things white bright and weathered and I especially love all things farmhouse. 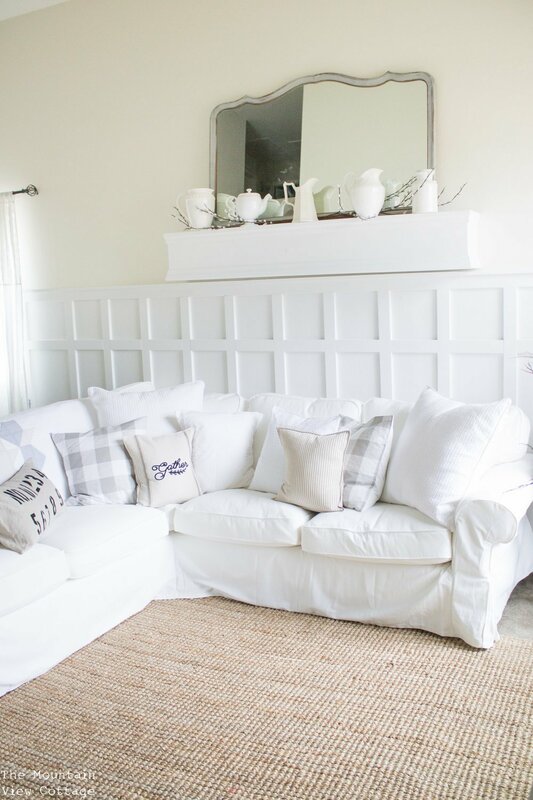 So lets talk about the elements that go into creating that ever loved farmhouse style in your home and you will see just how simple it is to create a space you love by slowly changing and adding to the style you are trying to achieve! 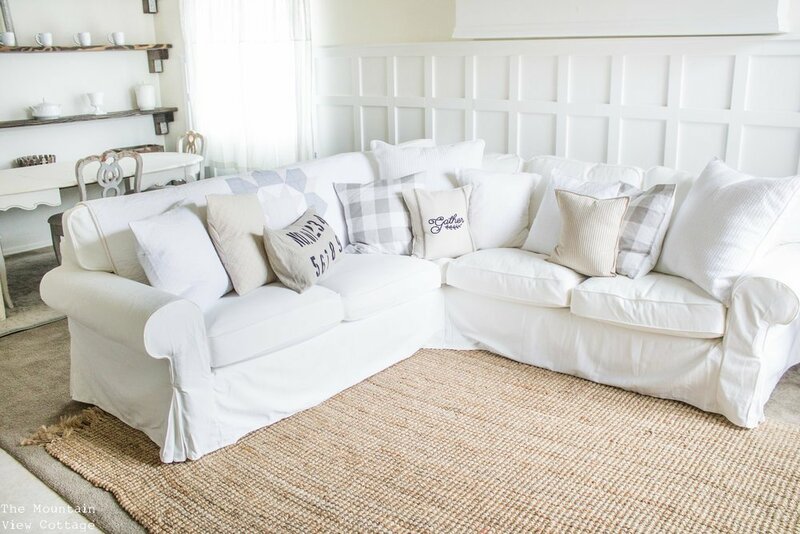 Throws are another way to add that cozy farmhouse style to your sofa and bed and can even help disguise a couch you may not love!! Here is a farmhouse quilt set that would add that warm farmhouse charm to your bedroom! 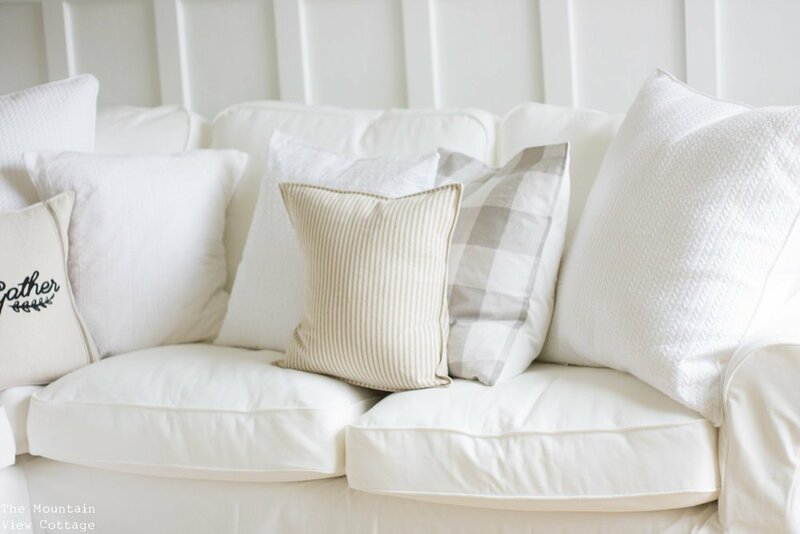 I love white quilts in the bedroom because with a blank canvas like a white or cream quilt you can add pops of color for each season or change it up with a few throw pillows!! It’s the perfect starting point! 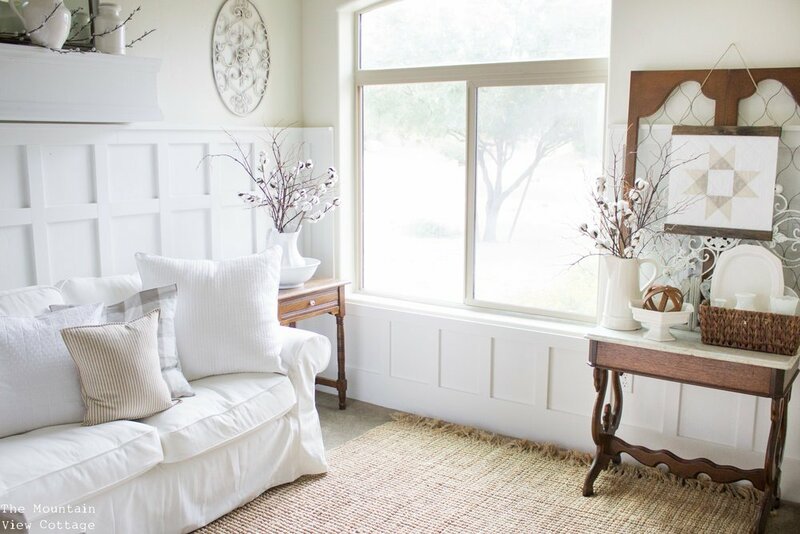 I love the look feel and texture that natural fiber rugs bring to a room! Pottery Barn has an amazing selection! If Amazon is your online store of choice here is one that’s nearly identical! 4. 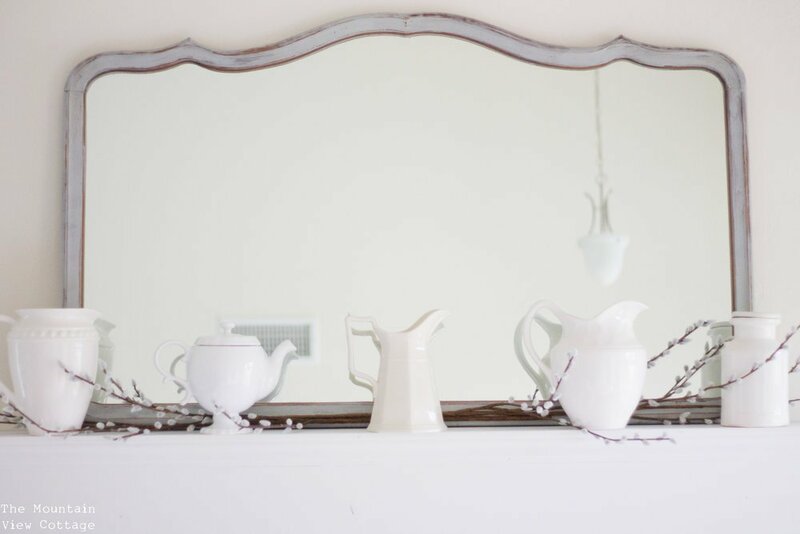 Farmhouse Decor- for example: white ceramic pitchers, vintage mirrors, antique finds, and rustic weathered pieces! 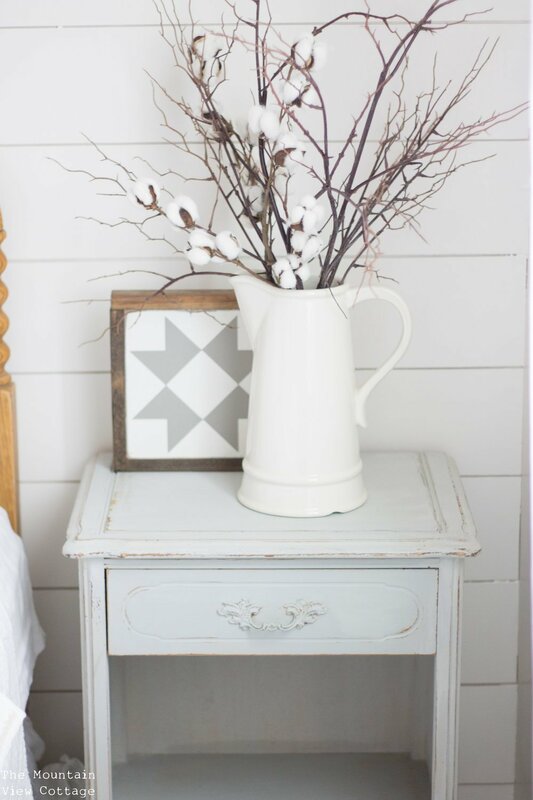 My favorite stores to find authentic farmhouse decor is good will and antique stores! These pitchers are a mixture of thrifted finds and purchases from HomeGoods?. I love home goods and TJ max for things like crates and baskets, and I always find the most beautiful and affordable stems and leaf picks from Hobby Lobby like the ones in these pictures. If you Don’t wan to leave your home but want to find some beautiful authentic Antiques Ebay is a great place to search for old windows frames, doors, light fixtures old crocks and so much more!! ?I got this vintage mirror in a set furniture I purchased off craigslist it cost less than $50! Craigslist is a great place to score large pieces for less! While I love white EVERYTHING! I do also love to mix in some stained pieces into my spaces too! Weather it be a stained picture frame or small end table! This was an heirloom from my Grandmother, but I have purchased and seen many pieces like this on craigslist for well under $100! But garage sales and old furniture you already own are a great place to start!!! I love re-purposing old items to bring them back to life! 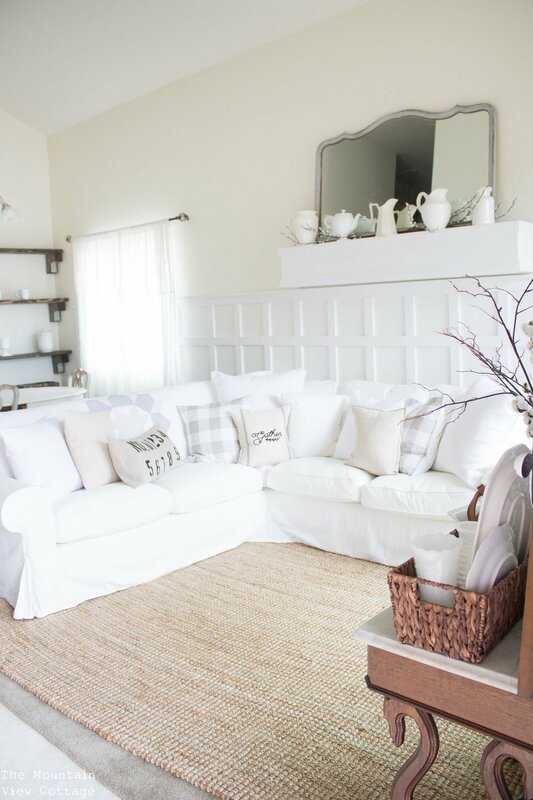 Open shelving is a great way to add farmhouse charm to your home! I have several different open shelving concepts in my home! Here is a full tutorial for these in this post!? if DIY isn’t your idea of a good time than this set from Amazon would be perfect too! 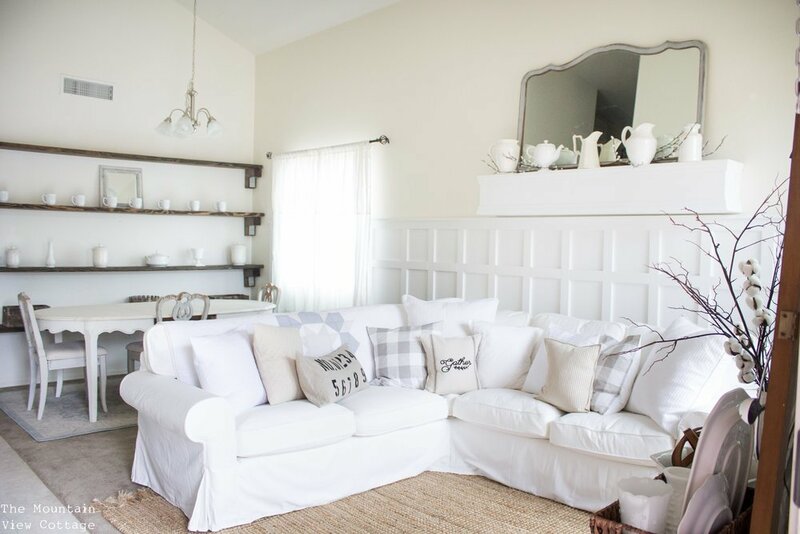 Like the open shelves there are so many DIY project that you can do to create farmhouse style in your home! 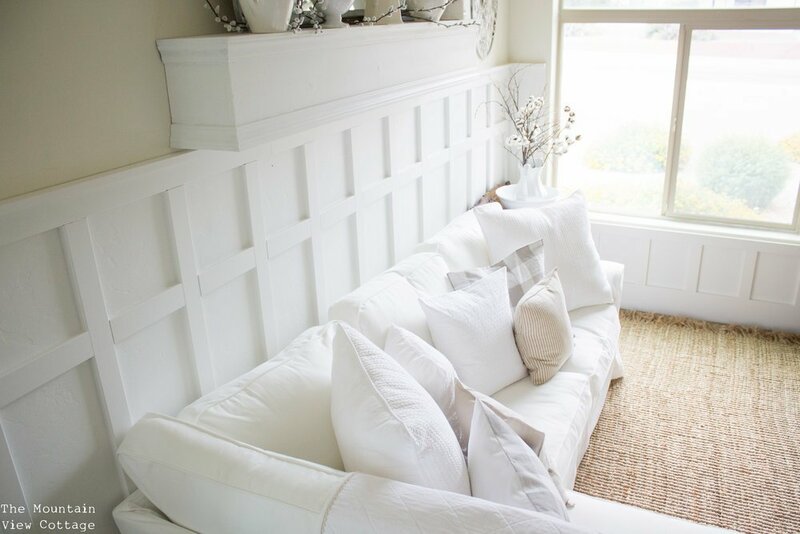 I particularly love to do wall treatments to create that warm cozy charachter!! Here are two DIY tutorials I shared to do just that in your own home! 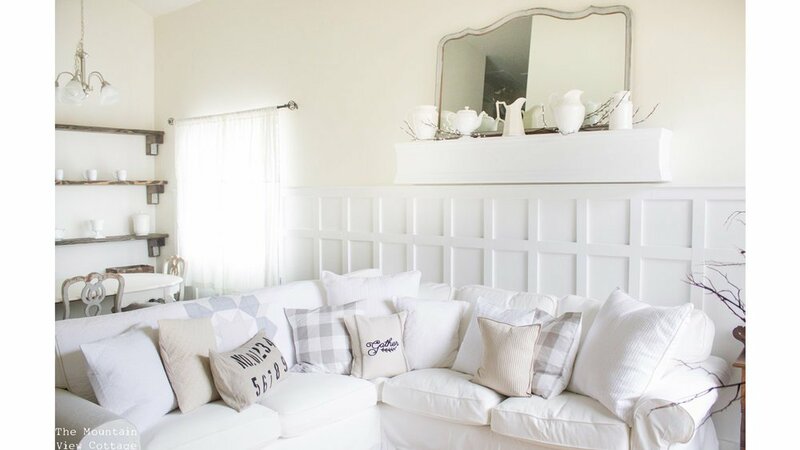 I also rounded up some other amazing bloggers who shared Farmhouse inspired DIY projects to add that farmhouse feel to your home in THIS post! The possibilities are endless when it comes to painting furniture! 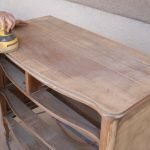 is my all time favorite medium to create that authentic worn and chippy look with painted furniture! I found this nightstand on craigslist, $50 for the set and made it over in shutter gray mixed with a little grain-sack! 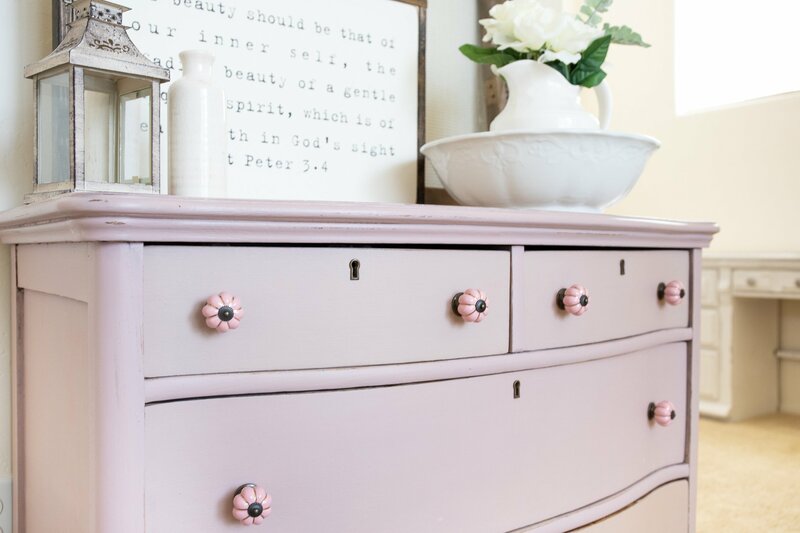 I also love this because you can shop your own home and make over old pieces that have been hiding in the attic or in the garage and bring them back to life!! 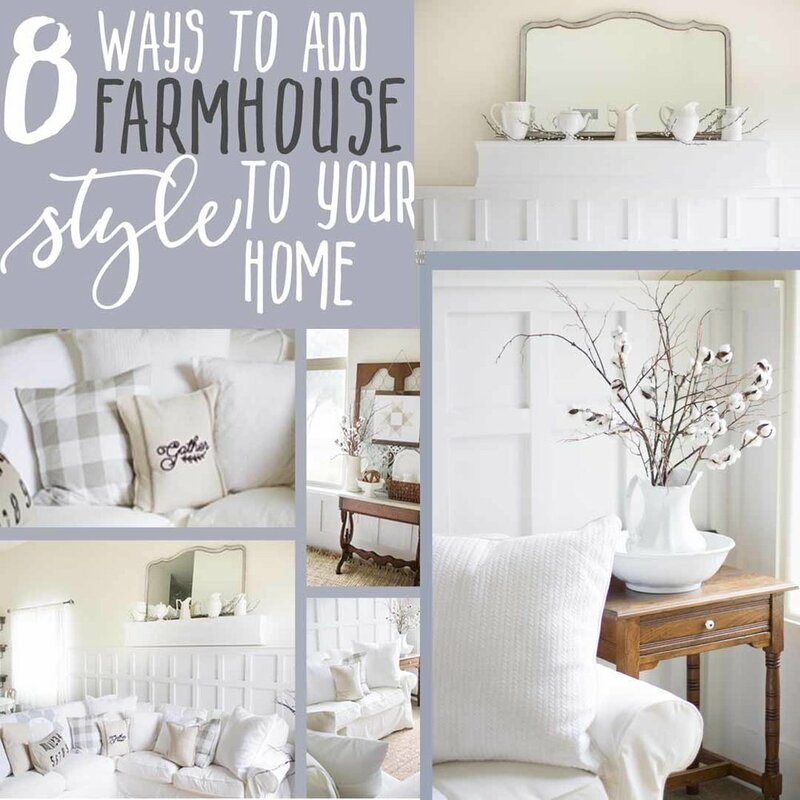 That concludes my 8 steps to achieving the farmhouse look in your home! 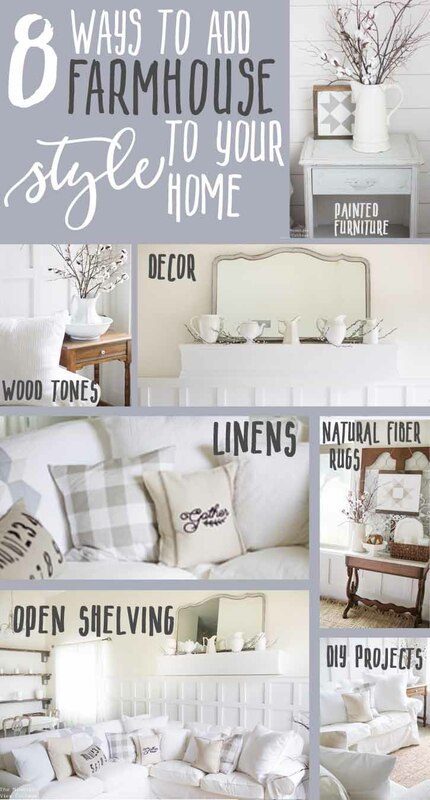 I hope you found this guide useful and you are now 8 steps closer to having a home that truly reflects a style that you love!!! Thanks so much for stopping by! before you go don’t forget to pin the image below to save these ideas for later! Thanks so much! 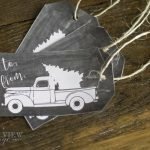 26+ Free Fall Printables for your home! Beautiful, thanks for the ideas!